On the 11th of October, the present destined for the Duke of Wellington, of a superb dessert-service from the King of Saxony’s porcelain manufactory, was exhibited to the public, and this beautiful specimen of Saxon art was afterwards packed in four morocco cases, which had been prepared for it. The sight was most interesting, and the hall was crowded with visitors. The ice-pails, which are of the most elegant and graceful form, are embellished with allegorical paintings, executed in the first style. The fruit-dishes, of various shapes and sizes, consisting of twenty-four pieces, are without painting, but magnificently gilt. The plates, one hundred and eight in number, constituted the most admirable part of the display: many of them were adorned with views of the different places where the duke has particularly distinguished himself, and others with designs from the first masters; and the whole affords a proof of the unrivalled excellence to which the art has been carried in that kingdom. This present will be accompanied by another from his Majesty from the damask-manufactory at Zittau, completed under the direction of M. Von Der Brehling. This was not publicly exhibited, but those who have seen it at the house of the banker, have been astonished at the perfection of the fabric, and the infinite taste and ingenuity displayed in the design and execution of the pattern. It consists of six table-cloths, of the amazing length of twenty ells, each six ells in breadth. 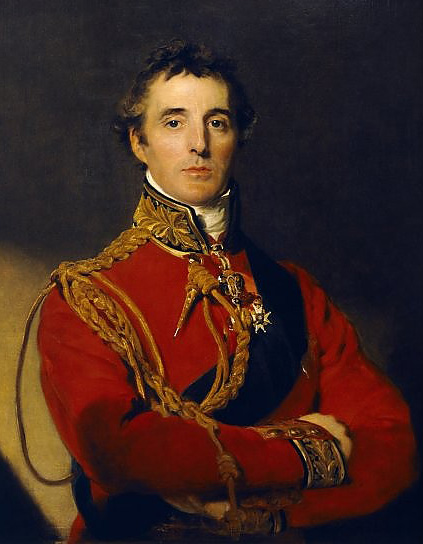 On one of them, the ground of which is ornamented with beautiful stars, appear the arms of the Duke of Wellington, encompassed with laurel, and various other insignia; at each end are grouped the emblems of War and Peace; a rich and uncommon arabesque border encircles the whole. The beauty of the effect consists principally in the apparently high relief of the figures on the clear silvery ground. The newly discovered method of shadowing, which may be termed a kind of painting in linen, has been carried to wonderful perfection. The napkins, on a small arabesque pattern ground, have also the Wellington arms, encircled by the order of the Garter, in the centre. I really wish the magazine had printed some drawings of the presents too as I would really love to see them. They sound beautiful, don’t they?